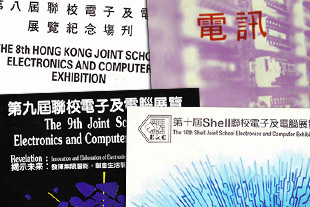 The predecessor of JSECS is the Hong Kong Joint School Electronics Society (JSES). 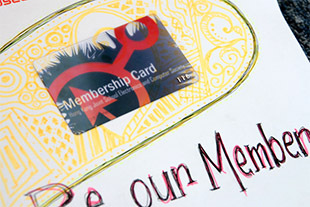 The JSES was founded on 21 November 1979 by a group of enthusiastic students who had strong interests in electronics. Mr. P. K. Tao, an experienced physics teacher and textbook author, was the teacher advisor who supported the founding of the society. As a local student organization, the JSES was the pioneer in the field of technology. At the infancy stage of the Society, the number of member schools was around 20. In those days, the development of personal computers had just started but was far from mature. Many science students in secondary schools were interested in electronics, especially in building analog amplifier circuits, designing digital logic circuits, and writing assembly codes for rudimentary microcontrollers. The major activities organized included seminars in electronics, hands-on workshops on building electronic circuits, inter-school quizzes, and social gatherings, etc. Due to the emergence of personal computers in early 1980's, the secondary students in Hong Kong had gradually developed their interests further from pure electronics to an integration of electronics and computer. In view of this, the Society had shifted the focus to the integration of electronics and computer technology. 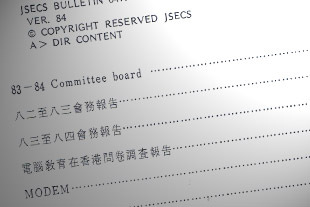 The JSES was renamed as the Hong Kong Joint School Electronics and Computer Society (HKJSECS) in September 1983. The Society grew steadily over years during this period. 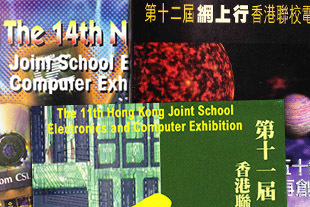 The 1st Joint School Electronics and Computer Exhibition was held from 23rd to 26th August 1984 in the Hong Kong Polytechnic, with the theme “Home Computerization”. The Exhibition eventually developed into an annual event of the Society. Representatives from member schools displayed and presented their projects in the exhibition gallery. The Exhibition is generally recognized as a rendezvous for the exchange of knowledge and building of friendship. Certain educational activities were held every year. Seminars on recent developments of electronics and computer technology, visits to local universities, and visits to the manufacturing or technological facilities in the industry, were welcomed by the members. The Society also gained public attention by participating in “0011”, a 13-episode educational television programme, aired on HK-TVB in 1983. Walkathon, Christmas Camp and Annual Ball had become the three traditional social activities of HKJSECS during this period. Funds raised by the Walkathons were used to subsidize the daily expenditure of the Society. The Christmas Camps provided a great opportunity for the committees and members to familiarize with each other such that solid working relationship was enhanced. The Annual Ball was also one of the most favourable social activities among the members. With the popularization of computer technology and the Internet in the general public in mid 1990's, HKJSECS continues to stay on the cutting edge of technology. The number of member schools augmented rapidly to 103 in 1996, and the activities of HKJSECS became increasingly diversified. In 1994, HKJSECS joined the Hong Kong Education Information Network (HKEIN) as a project partner with the Department of Information Engineering, Chinese University of Hong Kong (CUIE). The HKEIN project provides teachers with Internet connections and services such as email and FTP in Hong Kong, which access to the Internet was extremely scarce at the time1. The HKJSECS website went online in March of the same year. 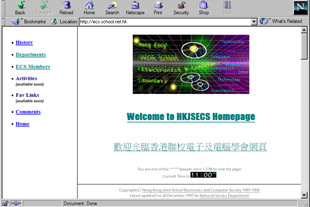 With the support of HKJSECS, the HKEIN was extended as the Hong Kong School Net (HKSN) in early 1996, providing low-cost Internet connection services to secondary school students in Hong Kong2. More than 2000 teachers and students were the beneficiary of the project3. The project eventually evolved into the Hong Kong Education City (HKEdCity) in 2000. Following the establishment of the School Net, the School Homepage Project was started in 1997, providing technical assistance to members schools for building their school websites. 1. Fong-Lok Lee, Chi-Chung Lam. Towards Online Learning - The Hong Kong Perspective. CUHK. 2. WONG Po-Choi (2000). 香港互聯網的教育應用及發展. Department of Information Engineering. CUHK. 3. CUHK (2000). CUHK: Father of the Hong Kong School Net. Retrieved January 2011 [Link]. As of today in the 21st century, electronics and computers have vastly penetrated our daily lives. We are very proud of our former committee members for their great vision back in the time, introducing state-of-the-art computer technologies to the public. In the new century, HKJSECS received challenges in transforming the role of the Society. Students and the public were well aware of the rise of computer and information technology in this era. Consequently, HKJSECS transformed from the role of a promoter to the role of a facilitator. The Hong Kong Outstanding IT Student Award was introduced in 2005 to recognise the aspiration and achievement of students contributing to information technology. Assessment criteria include the candidate's own achievement, aspiration and insight, and knowledge in the discipline. The candidates were invited to hold a public speech and attend an on-stage quiz on information technology during the annual Exhibition. At the same time, the Exhibition moved its roots from city halls to shopping arcades in order to attract a wider audience. 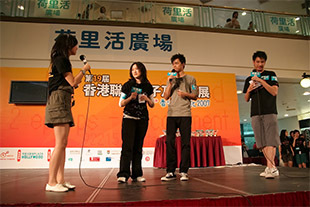 To promote teamwork among students, the Award was replaced by the Hong Kong Outstanding IT School Award in 2009. The new Award was a project-based competition, aimed at enriching students' knowledge in information technology. Students formed teams and proposed innovative products, demonstrating them at the annual Exhibition. The quiz component from the previous Student Award formed a separate competition as the Inter-school Information Technology Quiz in 2011. 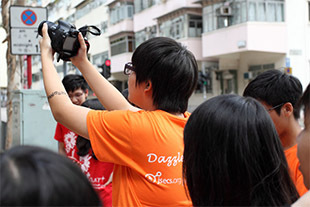 With the advancement of video production equipment, which heavily involves computers nowadays, the Hong Kong IT Culture Short-film Contest was held in 2007. Students entered the contest in teams and attended workshops dedicated to the contest. The contest later evolved into the Joint School Short-film Exchange Programme as a regular annual event. Another milestone event in 2007 was the HKCEE CIT Seminar, later the HKDSE ICT Seminar, held in response to an increasing popularity of computer-related subjects in the public examination.